A new research vessel, R/V Rutgers, has given undergraduate and graduate students from a variety of academic programs at Rutgers the opportunity to get out on the water and learn valuable data collection methods from members of the New Jersey Department of Environmental Protection (NJDEP). Throughout the months of April, May, and July, Dr. Josh Kohut, Associate Professor in the Rutgers Department of Marine and Coastal Science (DCMS) worked with the NJDEP to organize four research cruises on the Raritan to collect data with two new YSI ProDSS sensors acquired by DCMS earlier in the year. The YSI ProDSS sensor is the same equipment that the NJDEP uses to collect their water quality data. The cruises started in Sayreville where the boat is docked and moved into the Raritan Bay where the first “station” or sampling site is located. Here, students were tasked with slowly lowering the YSI sensors into the water. The sensor has a pressure gauge to estimate water depth and also collects information on temperature, salinity, pH, and dissolved oxygen every second while being lowered. After the sensors finished taking their readings at each station, the boat started its journey up the Raritan River, passing by a bald eagle’s nest, the old Sayre and Fisher Brick Factory, and finishing up in Boyd Park at the Rutgers Class of 1914 Boathouse. 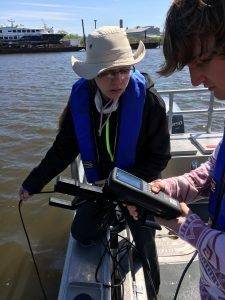 Adopting the procedures demonstrated on these cruises by the NJDEP, will allow information collected aboard the R/V Rutgers to be used by the NJDEP for their historical database for the Raritan River. For more information on the data collected during these trips, see the related post by Rutgers undergraduate student Laura Wiltsee.